This simple protein packed snack is super yummy! Full disclosure I ate the whole first batch of these in one sitting…I didn’t even tell my husband about them! I had to make another batch just to ask him if he wanted any! 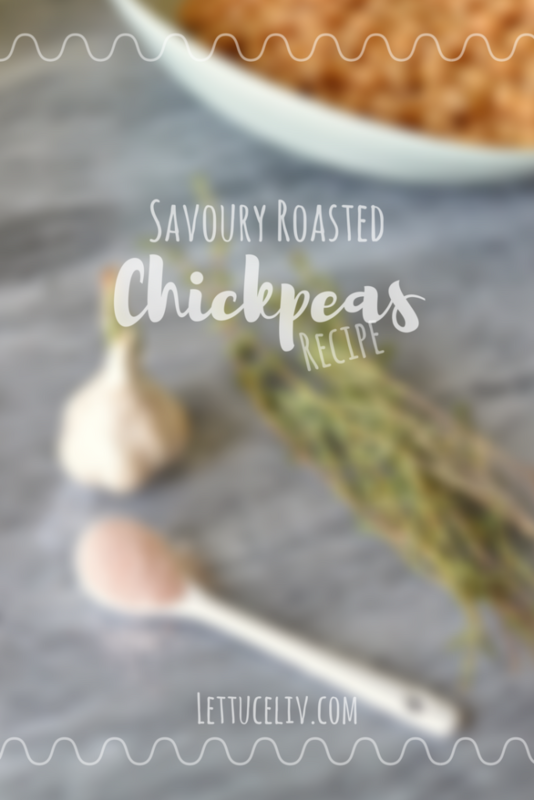 The main ingredient in this savoury roasted chickpeas recipe is Chickpeas! 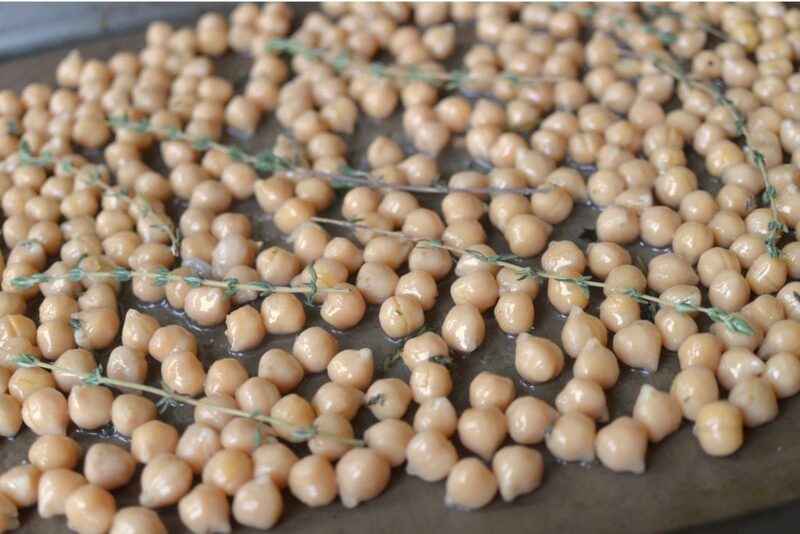 This yummy bean is used to make hummus, another treat that I can eat whole containers of without even blinking! The most obvious answer is they taste so freaked good! And they are so versatile countless recipes where chickpea is the main event with, burgers, roasts, dips and you can mile it into a flour and the opportunities are endless! I love this recipe because I actually use it as a snack for when I was something and don’t know what it is. Have you ever had that kind of craving.. the one where your binge eating in your pantry because nothing you find is what your craving but you juts go at it thinking you’ll be satisfied… no? Is it just me then…. oups. Well more often then not my craving subsides after I have a nice batch of these yummy little roasted beans! And because there so nutritious I am comfortable With eating a whole cans worth of these savoury roasted chickpeas! This yummy treat is actually very simple you’ll need a can of chickpeas. 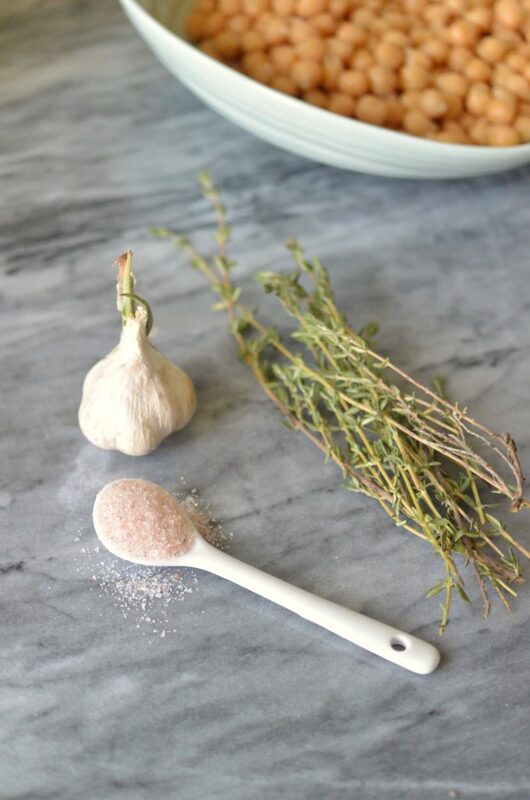 Fresh thyme, coconut oil salt and fresh garlic. 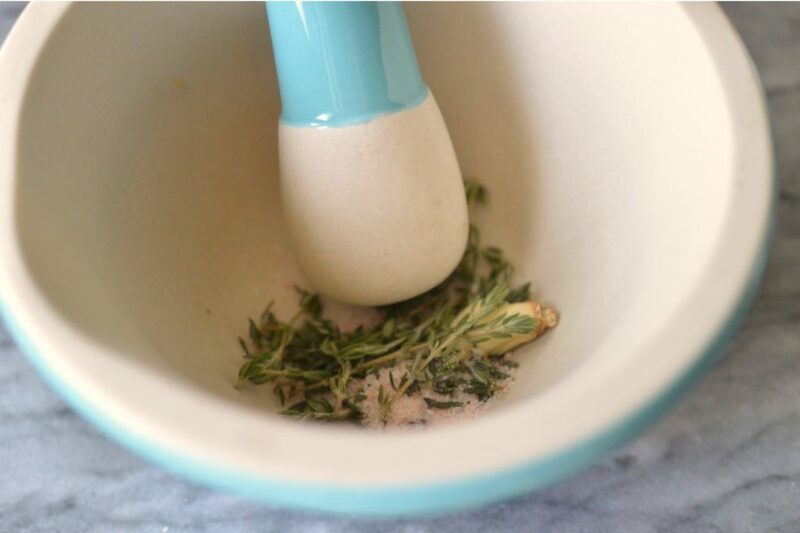 I took a mortar and pestle and made mashed up the garlic with the fresh thyme leaves adding the salt and massaging it in. Then I combines the coconut oil and toss in a bowl with the chickpeas. Coat well and then place in a pan. I left the chickpeas roasting in the oven for 45 minutes because I really like it o be crunchy. This is to your own tast so for this I say keep watching the oven at the 30 minute mark to see how roasted and crunchy you desire your chickpeas. Once they are ready and your able to touch them without burning your hands they are ready to eat! 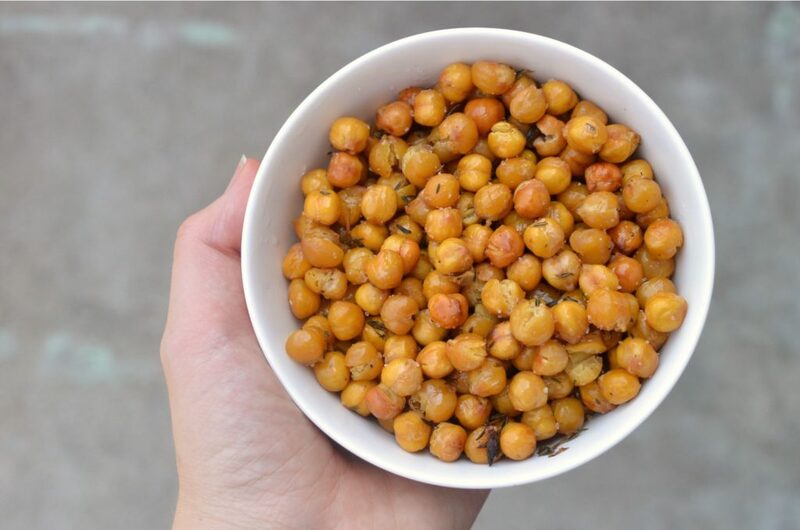 Toss them to a salad or set out a bowl filled with these yummy Savoury Roasted Chickpeas and enjoy my friends! Check out my peach jalapeño salsa recipe! Find me on Facebook Instagram and Twitter! Place the coated Chickpeas on a pan and bake for 30 minutes. After 30 ,invites check to see how much you want your Chickpeas to be Roasted. 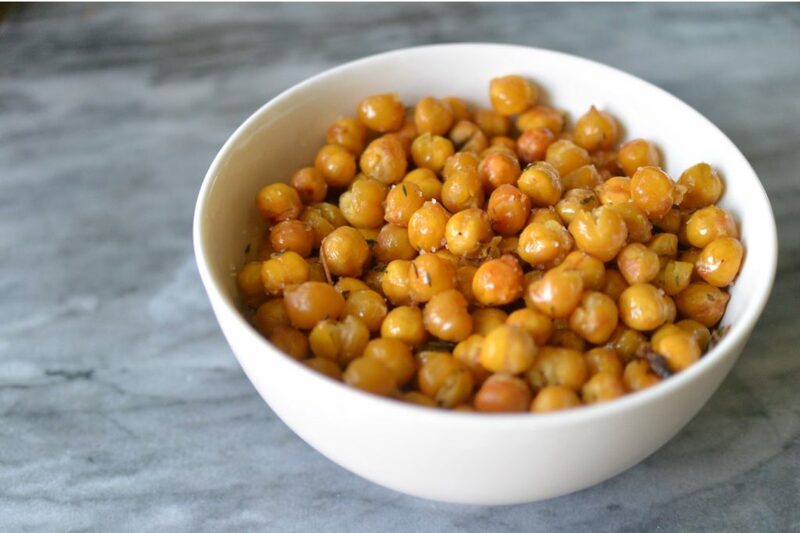 This is one of the simplest recipes I have found so far on roasted chickpeas… love it! I’m glad you’ve experimented with the crunchiness level. I will have to try your method of baking it longer since my chickpeas always turn out too soft. Excited to try this! I have seen soooo many recipes for roasted chickpeas. I just need to try it, already. They sound so good! Thanks for the inspiration! Yes you need to try it! So easy and tasty! 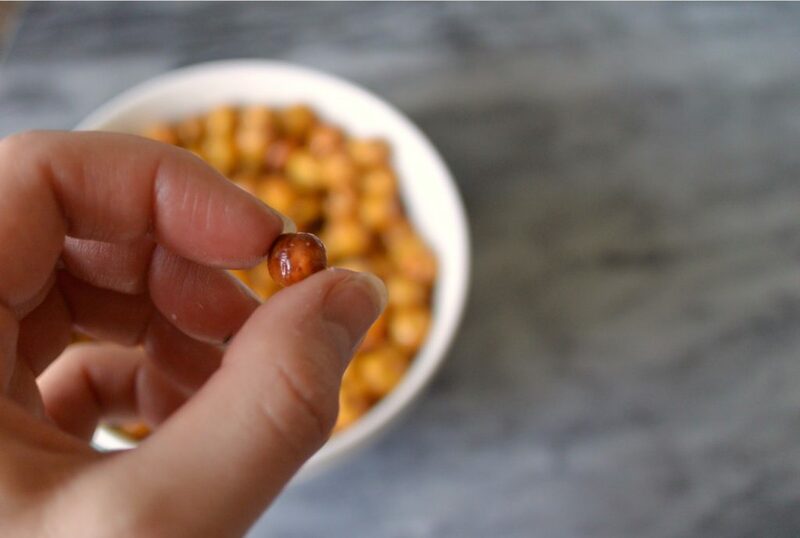 Roasted chickpeas are a classic snack in our house! Yea! How do you normally season them? You’ve reminded me just how good roasted chickpeas are. It’s been too long since I made any. Love your use of garlic and thyme. Aw thanks so much yea I’ve been on a bit of a thyme obsession these past few months! These look declious!!! Totally trying these out asap! Amazing! Love to hear how it turned out! That looks so good and easy! Thank you for sharing! Aw glad you enjoyed it! Oh yumm Curry sounds like a great addition to roasted chickpeas! I’d have to make that myself too!! !